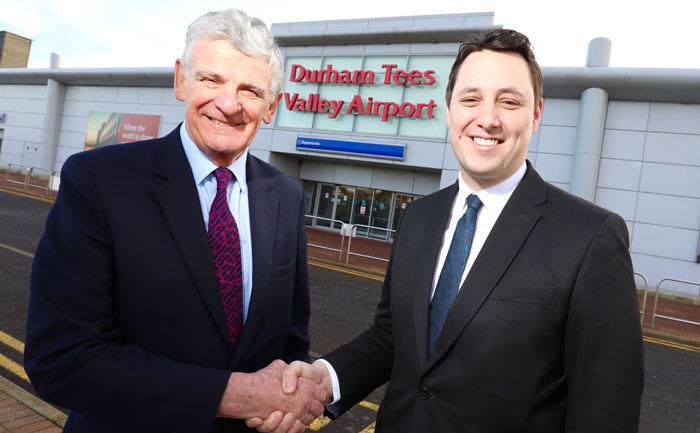 Tees Valley mayor Ben Houchen and Peel Airports has announced that terms have been reached to bring Durham Tees Valley Airport (DTVA) back into public ownership. Following a period of discussions under a non-disclosure agreement, the mayor has presented a proposal to acquire Peel’s 89% shareholding in DTVA and 819 acres of land for £40m. As part of the agreement, a parcel of land with outline planning permission for 350 homes will also be purchased. The Mayor has committed to stopping the planned housing development. The mayor – pictured above (right) with the Peel Airports chairman Robert Hough – has now called an emergency meeting of the Tees Valley Combined Authority Cabinet in January 2019 to approve the deal. The deal, if approved by cabinet, will transfer ownership of DTVA to the Tees Valley Combined Authority early in 2019. The Tees Valley Combined Authority is one of seven mayoral combined authorities in England. It is responsible for economic growth and job creation in the area. Its cabinet is made up of the leaders of Darlington, Hartlepool, Middlesbrough, Redcar & Cleveland and Stockton with the Tees Valley mayor as its chairman. With a total investment fund of £513m, the Tees Valley Combined Authority is charged with making local decisions to support the growth of the region’s economy. The mayor proposes to use just over 6% of that fund to bring Durham Tees Valley Airport back into public ownership – meaning there will be zero impact on people’s council tax bills, zero impact on public services and zero impact on businesses. At a joint press conference hosted at the airport on Tuesday, mayor Houchen said: “I am delighted to confirm that I have reached a deal with Peel to bring our airport back into public ownership. “This is a deal that will secure our airport’s long-term future, and delivers on the number one election pledge I made to the people of the Tees Valley. “I know some politicians promise the world and walk away from their responsibilities, but I won’t be that type of politician. “The people asked me to take back control of our airport, and now I’m doing just that. This is the democratic mandate that I have been given. “Using the money devolved to our area from central government, I am proposing to use just over 6% of that – £35m – to acquire Peel’s shareholding in our airport and 819 acres of land. “In order to stop the planned 350-home development outside the terminal, we have agreed to acquire the land with planning permission for £5m. Stopping this development is central to our long-term plan to make this airport great again. “We have over £513m from central government to invest in local priorities that we determine. For the people of the Tees Valley, having a thriving local airport is a priority. “Because I am proposing to use money devolved to our area from central government, there will be zero impact on people’s council tax bills, zero impact on local authorities, zero impact on public services, and zero impact on local businesses. “The people of the Tees Valley will not have to pay a penny extra to finance this acquisition. Our valued public services will not be affected by this deal, our councils will be completely insulated and protected, and our other priorities will still be delivered on. “Taking back control of our airport presents a once-in-a-generation opportunity for the Tees Valley to find its voice again. “As we look to a positive future outside the European Union, we won’t just be competing with Newcastle, Leeds or Birmingham – our success depends on our ability to work, trade and collaborate with old friends and new allies around the world. “That means we have to be as accessible, visible, competitive and pro-active as possible, and it starts with securing the long-term future of our airport. “Over the coming weeks, I’ll be setting out a new path, with a new vision and new leadership to take this airport into the future. That includes announcing a new airport operator, and a 10-year business plan drive forward our ambitions for the airport. “The ultimate deal will be public, voted on and will require the support of our five local authority leaders. We will be completely open, honest and transparent throughout. “I need the five leaders of our local councils to vote in favour of this plan. If they don’t, we can’t progress. It’s as simple as that. “Our council leaders have always wanted to see this airport thrive – and now I’m calling on them to back our plan to make this airport the success we know it can be. “Failure to secure the future of this airport will deprive the region of a significant economic asset. “That’s why the deal we have agreed is worth it: it’s worth it to businesses that want the connectivity they need to grow, it’s worth it for families that saves up throughout the year to get a break in the sun, and it’s worth it for the private investment this acquisition will unlock. “With a new plan, new leadership and a new vision, the People’s Airport will pay for itself. “I’d like to take this opportunity to thank Robert Hough and Peel for the open and constructive way they have approached these discussions. Peel Airports chairman Robert Hough said: “Further to the election of mayor Ben Houchen, as the airport owners and operators since 2003 we have in good faith shown willing to engage with the mayor on his ambition for the future of Durham Tees Valley Airport to return to public ownership. “Following numerous meetings over many months a proposal has been put forward by the mayor to fully acquire the Peel Group’s 89% shareholding in DTVA. “At this stage we have an agreement in principle, subject to approval by the local authority leaders. “We understand the Mayor will now seek support for his proposal from the leaders and we await further progress on this. “Should a sale proceed then Peel will work seamlessly with the mayor and the combined authority to ensure a smooth transition.